Parents, relatives and spouses have gathered at the Eastin and Equatorial Hotels in the Bayan Baru area for the occasion. GEORGE TOWN: Two leading educational institutions here held their annual convocations where thousands of bouquets and graduation paraphernalia went on sale here. Such novelty items have become a huge seasonal item, especially during graduations, birthdays and on Valentine Day, said Khoo Meng Lee, who is a major trader of such items. First was the 27th Convocation for the Disted College where 344 diploma and first-degree students graduated at the Eastin Hotel here. As the VIPs led by DISTED College board chairperson Datuk Seri Dr Stephen Yeap, college’s president and chief executive officer Dr Seah Soo Aun, its director of academic affairs Dr Jerry Koay Chew Chai took to the stage, they were joined by the college’s academic partners. Staffordshire University from UK sent its partnerships and region’s pro-vice-chancellor Prof Ieuan Ellis and Help University’s Department of Psychology head Dr Phihadi Kususanto to join the memorable occasion. 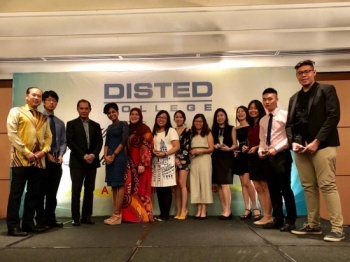 The Valedictorians this year were Elizabeth Khoo Woon Lynn, who obtained her diploma in business studies and Wong Shu Wen, who scored First Class Honors in the BA Marketing Management. After addressing their fellow students, they shared their insights with theSun, saying the art of studying was balancing their time, and planning ahead for important schedules such as examinations. Khoo wants to work in human resources whereas Wong has secured a job in an online marketing company. Besides becoming top students, they also have another thing in common – both studied at the nearby St George’s Girls School here. The other outstanding graduates were Ho Yu Heng, Koh Hui Ling, Chew Pei Ying, Ooi Yun Lin, Shannon Benjamin Sim Shang Yue, Sophiyanah David Christopher, Ch’ng Jay Min, Lim Fang Wei, Lee Wen Jun, Jonathan Chow Hoong Khun, Lee Huei Theng and Lim Kai Kei. On Sunday, the RCSI & UCD Malaysia Campus (formerly Penang Medical College) would hold their ceremony at the Equatorial Hotel where 130 undergraduates will become doctors. The RCSI & UCD Malaysia Campus had recently attained the “Foreign University Branch Campus” status by the Higher Education Ministry. The 10th in Malaysia to receive this honour and award, PMC is now called the Royal College of Surgeons in Ireland (RCSI) and University College Dublin (UCD) Malaysia Campus or RCSI & UCD Malaysia Campus, RUMC in short.